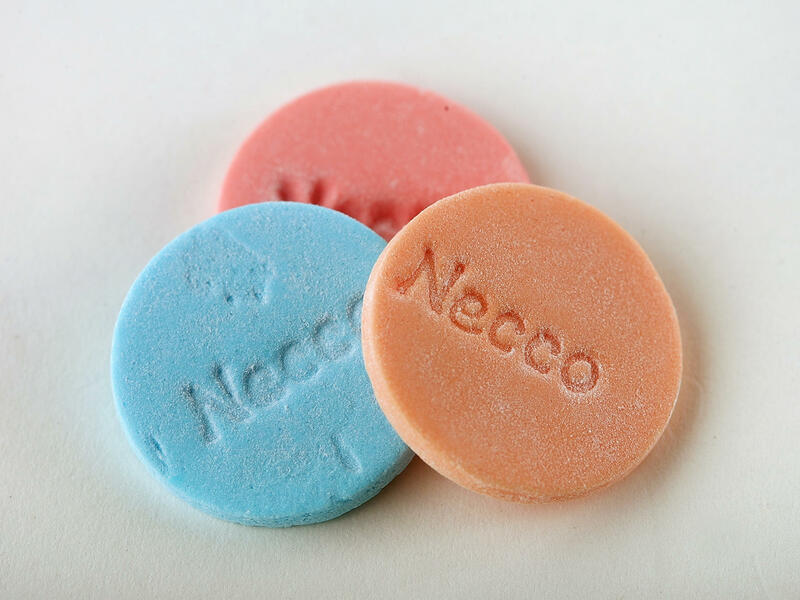 Rumors of the NECCO maker's impending demise have sparked a renewed interest in its products â especially its famous chalky-tasting wafers that some people love to hate. NECCO candies for sale at Sugar Heaven in Somerville, Mass. David Sapers says Sugar Heaven will buy up as many as it can if it looks like NECCO won't survive. "Also NECCO makes things like Squirrel Nut Zippers, Mary Janes, Slap Stix. And obviously during Valentine's they're big with their ... conversation hearts," he says. NECCO is an acronym for the New England Confectionery Co., which is in financial trouble. If its leaders can't find a buyer by early May, the company says it will have to shut down, laying off hundreds of workers at its factory in Revere, Mass. The company didn't respond to requests for an interview. But at Sugar Heaven, Sapers is getting ready. "I just ordered 10 cases of [NECCO's products] yesterday, which were delivered on Thursday. So I did that because first of all, they don't go bad. They're going to last for a while, and just in case something happens, we have it." Customers Inge Nakel and Michelle Scannell buy some candy, including a roll of NECCO wafers. The classic roll has an incongruous mix of flavors, including orange, licorice and clove. "I love the chocolate ones," says Nakel. "You can buy a whole roll of chocolate. That's the best thing in the entire world," Scannell says. "You know what's best, is their conversation hearts," says Nakel. Scannell agrees. Those candy hearts with little amorous messages on them are a Valentine's Day staple, and Sapers says Sugar Heaven will buy up as many as it can if it looks like NECCO won't survive. And he is not the only one stocking up. "Today alone we probably sold 30 cases. We're selling a lot," says Jon Prince, who runs the online retailer Candyfavorites.com. He says sales of NECCO wafers have spiked. One caller wanted to buy his whole inventory, but he is limiting the size of each sale. "And the person actually started to cry and they said they couldn't imagine a world without their NECCO wafers," he says. NECCO traces its roots back to 1847, when the Chase brothers started making candy. It wasn't until a merger in 1901 that the firm officially became the New England Confectionary Co. The famous wafers are memorialized by a small sculpture in a park in Cambridge, Mass., near where the company's factory once stood. The metal sculpture depicts a paper bag, with NECCO wafers spilling out of it. Kelly Haugh, who works in the building next to the sculpture, is a huge fan of the candy. "My mother-in-law, like, probably three years ago, found out that I was obsessed with NECCO wafers and started just buying them for me," Haugh says. Every Christmas, her stocking is full of them. "So I think I liked them a whole lot more when I didn't have a cabinet full of them. But now I'm glad I have my stash," Haugh says. She realizes not everyone is a fan. Its flavor and texture can be pretty controversial. "They're definitely not a normal thing for people to love. It's like people say they're chalky or whatever," Haugh says. But standing near the statue, Joey Barbosa tried them for the first time and had a more positive reaction. "Mmmm. They're very good. Crunchy, tasty. Pretty much it," he says. Another NECCO fan, Spencer Ordway, is hoarding wafers, but not because of their tasty crunch. He runs a sleepaway camp in Maine, and for more than 70 years, at an end-of-summer carnival, campers have used NECCO wafers as a currency to play games and buy prizes. "I had so many alumni and current staff contacting me today saying, 'What are we going to do? How can we save enough NECCO wafers to, uh, cover us for years to come?' " Ordway says. So he went online and bought enough to keep the carnival funded for the next few years. And he says the camp's stash is safe, since he is not likely to be raiding it anytime soon. "I mean, it is really like chewing on chalk." 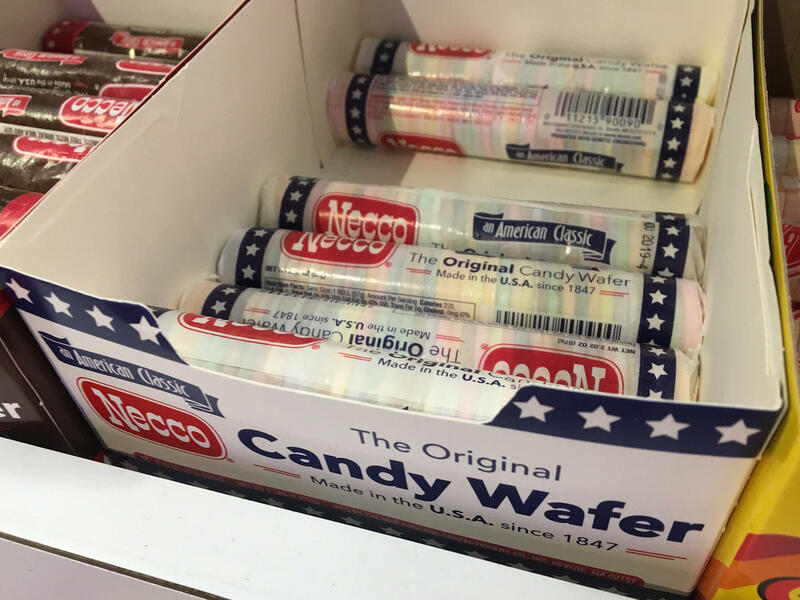 Even so, he is still hoping the company can pull through somehow, so NECCO wafers — and the company's other candies — will be available for generations to come. Necco Wafers are a polarizing candy. Some online haters have compared the brittle sugar discs with their muted colors to chalk or to antacid tablets. Necco also has some very loyal fans who can't imagine life without the wafers. Now, we're talking about this because the company that makes Necco Wafers is at risk of going under. Craig LeMoult of member station WGBH reports. CRAIG LEMOULT, BYLINE: At Sugar Heaven in Somerville, Mass., David Sapers points out there's a lot more Necco on his shelves than just those controversial wafers. DAVID SAPERS: Here we have our Necco Buttons. We carry them on the wall here. We also - around the corner, we have our Necco Sky Bar and also Necco makes things like Squirrel Nut Zippers, Mary Janes, Slap Stix. LEMOULT: The New England Confectionary Company, which traces its roots back to 1847, is in trouble. If they can't find a buyer by early May, the company says it'll have to close, laying off hundreds of workers in its factory in Revere, Mass. The company didn't respond to requests for an interview, but at Sugar Heaven, Sapers is getting ready. SAPERS: We just ordered 10 cases of each. Just in case something happens, we have it. UNIDENTIFIED PERSON: Do you want a bag, or are you all set? MICHELLE SCANNELL: We're all set. Thank you. LEMOULT: Customers Inge Nakel and Michelle Scannell by some candy, including a roll of Necco Wafers. The classic roll has an incongruous mix of flavors, including orange, licorice and clove. INGE NAKEL: I love the chocolate ones. SCANNELL: You can buy a whole roll of chocolate. That's the best thing in the entire world. NAKEL: But you know what's best is their conversation hearts. LEMOULT: Those candy hearts with little amorous messages on them are a Valentine's staple, and Sapers says Sugar Heaven will buy up as much as they can if it looks like Necco won't make it. And he's not the only one stocking up. Jon Prince runs the online retailer candyfavorites.com and says sales of Necco Wafers has spiked. JON PRINCE: Today alone we probably sold 30 cases. We're selling a lot. LEMOULT: Prince says one caller wanted to buy his whole inventory. But he's limiting the size of each sale. PRINCE: And the person actually started to cry, and they said they couldn't imagine a world without their Necco Wafers. LEMOULT: Those little wafers are memorialized by a small sculpture in a park in Cambridge, Mass., near where the company's factory once was. It looks like a paper bag with Necco Wafers spilling out of it. Kelly Haugh, who works in the building next to the sculpture, never noticed what was in the bag. KELLY HAUGH: Oh, interesting. Yeah, I had no idea. LEMOULT: She's actually a huge fan of the candy. When her mother-in-law found out she loves them, they became a regular gift and have started to pile up. HAUGH: I think I liked them a whole lot more when I didn't have a cabinet full of them (laughter). But now I'm glad I have my stash (laughter). LEMOULT: Standing near the small sculpture, Joey Barbosa tries a Necco Wafer for the first time. JOEY BARBOSA: They're very good - crunchy, tasty, pretty much it. LEMOULT: Another Necco fan, Spencer Ordway, is hoarding wafers but not because of their tasty crunch. He runs a sleepaway camp in Maine, and for more than 70 years at the camp's end-of-summer carnival, campers have used Necco Wafers as a currency to play games and buy prizes. SPENCER ORDWAY: And I had so many alumni and current staff contacting me today, saying what are we going to do? How can we save enough Necco Wafers to cover us for years to come? LEMOULT: So he went online and bought enough to keep the carnival funded for the next few years. And he says the camp's stash is safe since he's not likely to be raiding it anytime soon. ORDWAY: It is really like chewing on chalk. LEMOULT: Even so, he's still hoping the company can pull through somehow so Necco Wafers and the company's other candies will be available for generations to come. For NPR News, I'm Craig LeMoult in Boston. Transcript provided by NPR, Copyright NPR.